This object is a small round bowl with flared lip at the top. 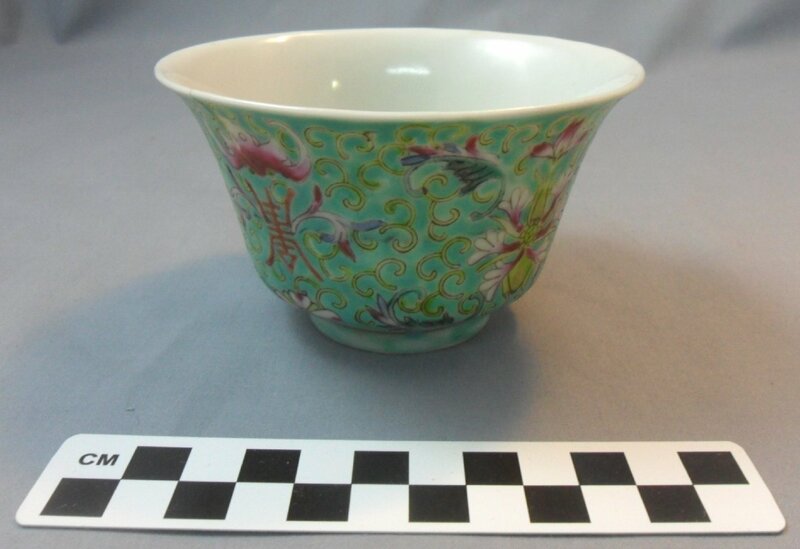 The inside of the bowl is white with a glossy finish while the outside is painted a sea foam green color with floral designs. Across the outside of the bowl there are small light green swirls that make up the vines and leaves of the flowers. The flowers themselves are purple with fading colors and large leaves of blue and purple. The design is slightly raised giving the bowl a textured feel. On the bottom and two sides of the bowl there is Chinese lettering in a brown/red color. The bottom of the bowl sits on a single slightly raised glass ring. There are some cracks on the object which have been repaired.